Coordinators: Picchietti Virginia, Salsini Laura A. 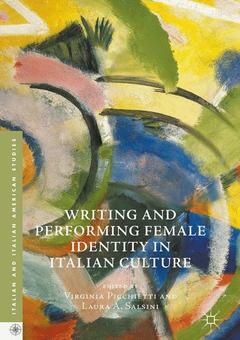 This volume investigates the ways in which Italian women writers, filmmakers, and performers have represented female identity across genres from the immediate post-World War II period to the turn of the twenty-first century. Considering genres such as prose, poetry, drama, and film, these essays examine the vision of female agency and self-actualization arising from women artists? critique of female identity. This dual approach reveals unique interpretations of womanhood in Italy spanning more than fifty years, while also providing a deep investigation of the manipulation of canvases historically centered on the male subject. With its unique coupling of generic and thematic concerns, the volume contributes to the ever expanding female artistic legacy, and to our understanding of postwar Italian women?s evolving relationship to the narration of history, gender roles, and these artists? use and revision of generic convention to communicate their vision. Virginia Picchietti, Professor of Italian at the University of Scranton, USA, writes on twentieth- century Italian women authors and on Italian Jewish Literature and Film. Laura A. Salsini, Professor of Italian at the University of Delaware, USA, writes on nineteenth- and twentieth-century Italian women authors. Brings together a wide variety of source material including Italian prose, poetry, theater, and cinema from the post-World War II period to the early twenty-first century.